This tester is specially targeted at the High Volume Memory Module Manufacturers. The SP3000 DDR3 LR-DIMM DDR3 Tester comes with a standard 240pin DIMM socket for testing the latest DDR3 LR-DIMM memory. The SP3000 DDR3 LR-DIMM Tester is built with flexible architecture to support DRAM, SDRAM, DDR, DDR2 & DDR3 Memory Module testing with a change of optional adapter. The SP3000 DDR3 LR-DIMM Memory Tester. The CST SP3000 DDR3 LR_DIMM Adapter is the latest test adapter for the SP3000. It supports testing of 240-pin DDR3 LR-DIMM that complies with JEDEC standards. The SP3000 DDR3 LR-DIMM adapter plugs into the existing SP3000 base tester. This makes the DDR3 LRDIMM adapter by far the most cost-effective solution for testing high-speed DDR3 LR-DIMM modules. No special setup is required. As with all of CST products, the adapter is simple to use. Insert the DDR3 adapter, turn the SP3000 tester on, insert a DDR3 LRDIMM module into the heavy duty Yamaichi test socket, then press the start button to begin testing. CST has incorporated latest state-of-the-art technology "DDR3 Memory Controller” in the design of the new SP3000 DDR3 –LRDIMM Adapter. High efficiency switching power regulator to generate the DDR3 STTL-15 interface power source. Build in analog circuit for measuring the module's current, voltages. User Programmable controlled Vtt regulator. High resolution VDD high efficiency switching power regulator. The SP3000 DDR3 LRDIMM adapter includes many new features which are relevant to the differences between DDR3 technology and the older DDR2 and DDR technology. 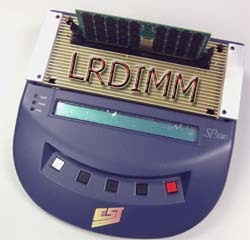 As with all of CST SP3000 testers, each LRDIMM module's size, structure, and type are automatically detected, without the need for user's setup. The test flow follows our standard Basic Test, Extensive Test, and Auto-Loop process. The SP3000 DDR3 LRDIMM adapter is very simple to operate, with little training or setup required. Test all DDR3 LRDIMM at lower frequency. Supports new LRDIMM mode registers enhancements. Improved current and temperature sensing circuitry. Parallel testing capability of 64/72-bits. Heavy Duty , 240-pin test-quality for convenient module handling. Automatic detection and support for LR DIMM modules. Support up to 16 rows and 12 column address lines to support 32 GB modules.